Lots of Squares in a Nine Patch Quilt! When you plan to make a Nine Patch quilt, you better plan on cutting lots of squares. 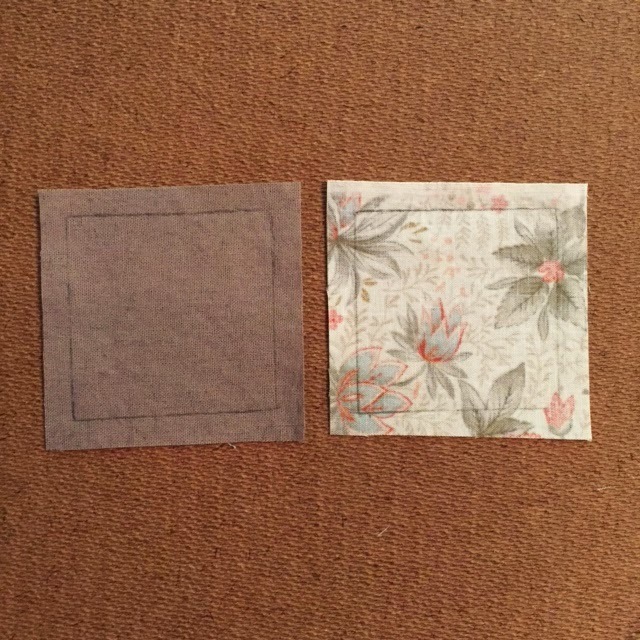 In my first post for this project, I said this would be a scrappy nine patch quilt, and that it would take a lot of 2.5 inch squares of both scrappy prints and solids, plus whatever fabric you chose for the background. My background is a gray print. 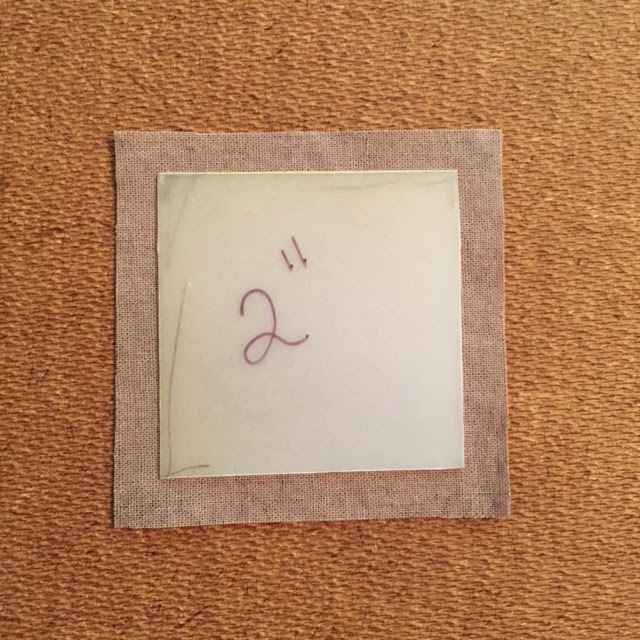 This picture shows a 2.5 inch square of the background fabric with a 2 inch square of template plastic set on top. There is a 1/4 inch seam allowance all the way around the edge of the square. I have taken a mechanical pencil and traced around the 2 inch plastic template to mark my sewing lines. I have also taken one of the scrappy 2.5 inch squares and traced around that. 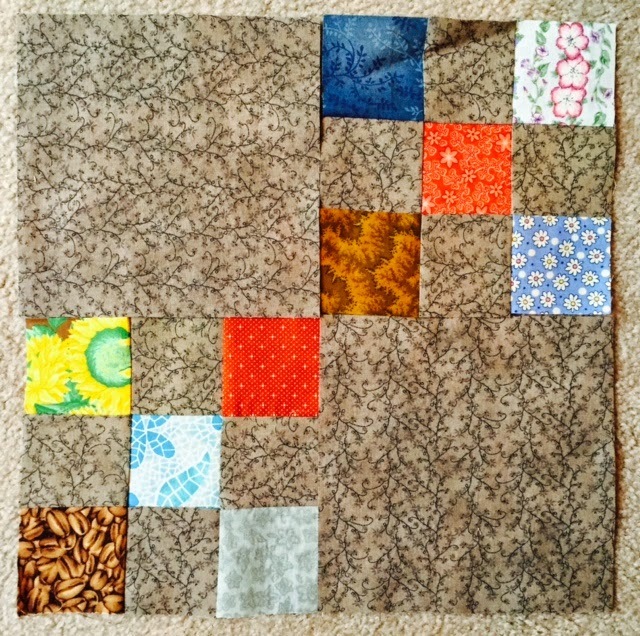 This picture shows both squares together, ready to be sewn. In addition to the 2.5 inch squares, you will also need 6.5 inch squares of your background fabric. In my quilt, that is the gray print. What you see here are two scrappy nine patch blocks laying next to two 6.5 inch gray print blocks. You will be replicating what you see here with your background and your scrappy squares! Your next step is to keep cutting those 2.5 inch squares, and to start cutting some 6.5 inch squares. Now that you can see the direction we are taking, you should have a better idea of this project. Have fun cutting! Stay tuned for the next step which includes hand sewing your blocks together! 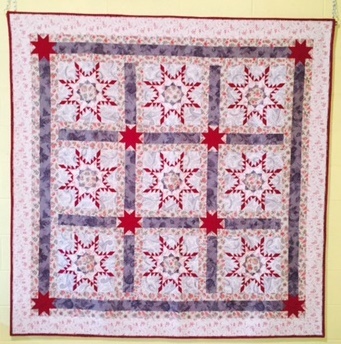 Published by Caron Mosey at Michigan Quilts! 2015. Thanks for leaving a comment! Please be sure to include your name, and make sure your email address is enabled so I can respond.